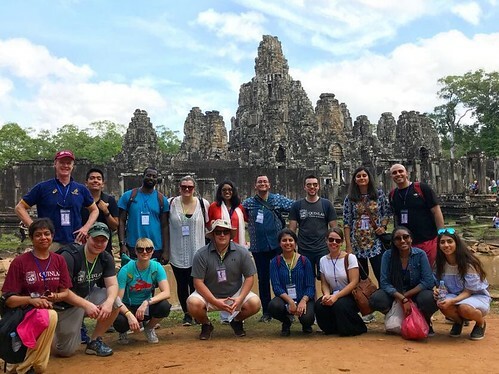 Below the trip photo gallery, read Quinlan graduate student Nayantara Abraham's reflections on her life-changing experiences. To be perfectly honest, it is hard to describe this trip and what we gained from it without resorting to a bunch of tired clichés and superlatives. We were 15 strangers thrown together for a brief but intense experience abroad. We did not know what to expect, apart from a whirlwind tour of Southeast Asia: visiting three countries in a little over 10 days. For many of us, Vietnam, Cambodia, and Thailand had just been names on the map and we did not know enough to even distinguish between them. With their shared borders and history, how different could these three countries be? Our sensory extravaganza of Southeast Asian sights, smells, and sounds officially began in Ho Chi Minh City, although several of us had taken advantage of the long New Year’s weekend to arrive a few days early and spend time in other parts of the subcontinent. We soon realized that the Vietnamese definition of “winter” was a bit different from ours. Wilting in the 100 degree heat, it was hard to imagine that at that very moment, an arctic blast was tearing through Chicago. We were happy to meet the wonderful staff and distinguished alumni at Loyola’s Vietnam Center. It was illuminating to hear firsthand from entrepreneurs about the political and legal issues involved in managing a business in such a vastly different cultural landscape. Sightseeing at the various city landmarks and museums revealed a great deal about “The American War” from a different perspective. The early mornings and packed schedule kept us too busy to realize how jetlagged we were—until we fell gratefully into bed each night, experiencing some of the most sound sleep we have ever had. Our gastronomic adventure continued in Cambodia (or Kampuchea as it is known in the local Khmer). We dauntlessly tried new foods each night in Siem Reap while each day took us on an intrepid journey through a labyrinth of temple ruins, each with a more enchanting story than the last—the highlight, of course, being the indomitable Angkor Wat. Here, we were again confronted by the damage caused by a war that ended not so long ago. Despite the unimaginable horrors during those dark years and the regrettable fact that justice was never served, it was deeply touching to see how the Cambodian people have put it all behind them and are living fulfilling lives. It was a testament to the resilience of the human spirit and the power of granting forgiveness even when forgiveness is not sought. Another great source of inspiration was the many non-governmental organizations (NGOs) with dedicated volunteers, both local and international, focused on improving the lives of young Cambodians by providing training in vocational skills that would lift them out of poverty. Our cultural rollercoaster finally ground to a halt in Thailand. Going from the small historical town of Siem Reap straight to the bustling metropolis of Bangkok, we immediately noticed the stark change in atmosphere. This country owes much of its unique culture to the fact that it has never been colonized by European powers. Evidence of the people’s reverence for the ruling monarchy is everywhere and the gender-fluid culture is embedded even in the lilting tones of the language. Decidedly one of the most popular tourist destinations in Asia, Thailand’s GDP is flourishing. There were the same familiar cars and night markets that we had grown used to, but to our surprise now, the traffic was more streamlined and merchants less willing to bargain. The sheer opulence of the golden palaces harked back to the ruins in Cambodia, giving us a brief glimpse of what they must have looked like before the ravages of time and war made their indelible mark. Not wanting the trip to end, some of us continued the celebration in other parts of Thailand while others made extended stopovers in various Asian countries on their way home. It took us less than 15 days abroad to go from 15 strangers to 15 friends who cannot go 15 minutes without texting each other—except in business school-speak, we call that networking.